Saturday Volunteers - WHAT'S ALL THAT NOISE? GOOD NEWS – Saturday Volunteers – No more wading through mud, un-jacking the boats, and beating hands together to stay warm during "spring commissioning". 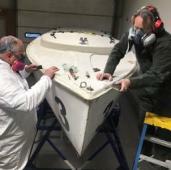 This year's Sailing School boat work has moved inside a big heated building, onto level cement floors, out of the weather. It's all pretty amazing. WE'RE WORKING INSIDE THE SHOP – there's a lot of serious detail epoxy and gel coat stuff that needs temperature controls. Included so far, rebuilding gunwales on #2 and #3, their decks and cuddy tops. WE'RE ALSO WORKING ON THE TARMAC – boats roll around on the tarmac. Easy to do the bottoms. THIS WEEK: SATURDAY VOLUNTEERS (April 13) – this week's action will be outside mostly. This is the next big job: to scrape, rough sand, and cure the bottoms ready for paint. WHAT TO WEAR THIS WEEK – Sailing School provides protection gear, but if you have your own 3M vapor mask (6006 Respirator or comparable), or goggles you like, please bring them. Like when you're sailing, having a change of clothing in the car is a good idea. WHY BOTHER? – The crew is excited. 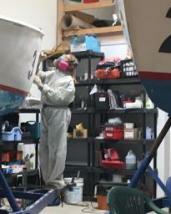 The rented workspace allows vessel-maintenance at a level way beyond what could be done outside in the mud. Carpentry and marine tasks and skills are showing up which are being shared as much as volunteers have time to invest. The Edgewood Rhodes will be totally tight, with new masts, new sails, new booms, and hulls tenderly restored. This 2019 is a banner year. CALL FOR SATURDAY VOLUNTEERS – The Saturday Volunteers are the team that carries the ball. Please sign in to be added to the roster and weekly up-dates and notice of Rhodes launching. RHODES LAUNCH DATE – The Rhodes are scheduled to be launched during the week May 13-17, then stepped and ready for sailing on EYC Opening Day. MORE TIME THAN SATURDAY? – A second crew works 4 or 5 hours each weekday. Contact Jonathan for details how to join in.